Every once in a while I see something out there in blog land that triggers an idea that is just so awesome, that it gets pushed right to the top of my to-do list. A few days ago, I discovered ABC and 123 which featured a color matching car parking lot made out of paper from Love and Lollipops. 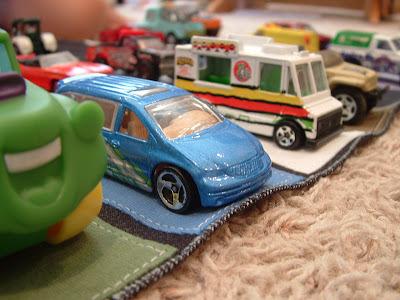 Anyone who reads my blog regularly knows how much Little Brother LOVES cars, and since colors is one of several themes we're doing in "preschool" I knew this would be perfect. I decided to make ours out of fabric though, because I know my boy...he needed one that would last. ...but since then, they've been almost inseperable. He has definitely caught the vision of matching the colors. Although when it comes down to it...he'll bend color rules a little to make sure all the spots get filled up, which is helping him notice the colors in the trim and other parts of the cars. And he loves using them with his other roads. 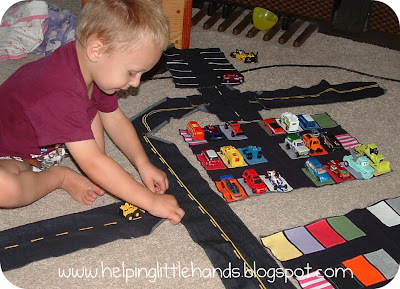 I made an extra one to send to one of our cousins who also has a set of these fabric roads. This really really doesn't need a full tutorial, but I'll give you a quick run down of what I did. I cut out a rectangle of denim I had left over from making him the fabric roads earlier. I zigzagged the edge of the denim to keep it from fraying. It was approximately 18x14 inches. Then I cut out 21 rectangles that were 2x3 inches out of Heat'n Bond Lite. 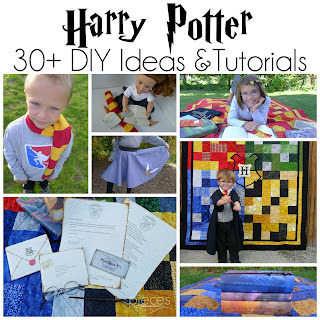 (You could easily do fewer, especially for a younger child.) I ironed them onto the back side of a bunch of colored T-shirt scraps, and then cut the rectables out again. Any kind of fabric scraps will do, but T-shirts are nice because the edges won't fray and then you don't have to finish them nicely. Then I lined them up on my denim, ironed, and sewed around the edges. Click here for my basic tutorial for applique if you've never done it before. I used 11 colors, each twice (except one was only used once.) The colors I used were red, orange, yellow, green, blue, purple, pink, black, white, brown, and gray. If I were to do this again, I would leave out pink. It turns out we don't own any pink cars. I had to tell him that pink is light red and to put red cars there. You could also leave out gray. It could be fun to include some kind of rainbow square that could match any color instead. 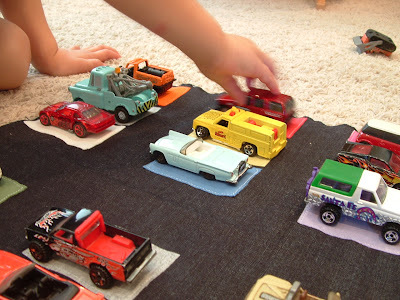 If you'd like to see my other projects for little boys (or girls) and their toy cars, my tutorial for the fabric roads is here and the dresser with painted roads is here. Whoa! Way to push the car concept to a whole new level!! I'll have to keep my eyes open for some pink cars for this dear grandson. Awesome! Thanks so much for sharing. I hadn't seen the original post on making fabric roads. 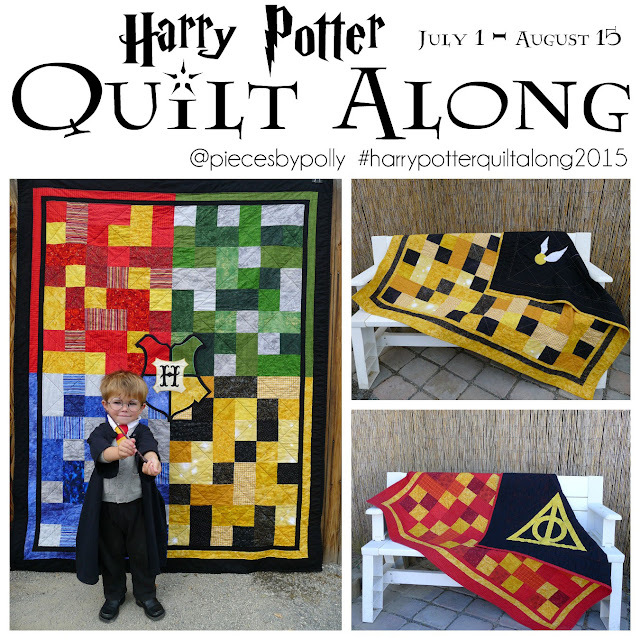 This is high on my list of things that I'm considering making for my nephew in the nearish future. Thanks for sharing! Love it! Fun AND educational. Brilliant idea. I love it! WOW, I'm thrilled that I inspired you!! I think that your fabric mat is AWESOME!! Thanks so much for coming over to let me know. Talk to me about zig zag stitching... Yours looks like it was done on a serger, no? I don't have a serger, but can zig zag stitch. I just don't understand how that holds it in from raveling, especially with washings. Your roads are awesome, and the car lot is such a great idea! Thanks so much for sharing! okay...LOVE! Teaching my boy colors now + he loves cars. Definitely gonnna do something like this. This is an AWESOME Idea. We are working on colors now and my boy is obsessed with Cars. I already made a set of roads so this will just complete it. What a great idea! I am definitely making this!! wonderful idea! 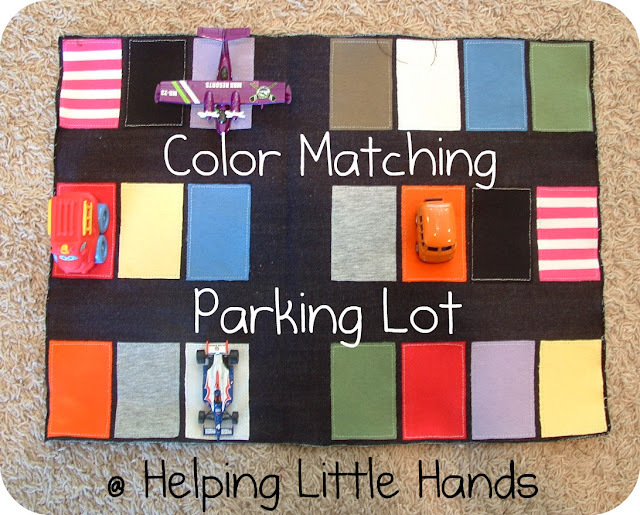 little ones just love matching and sorting... this is great! thanks for sharing your creativity. This is great! I love it and so happy to have found your blog. Great idea! 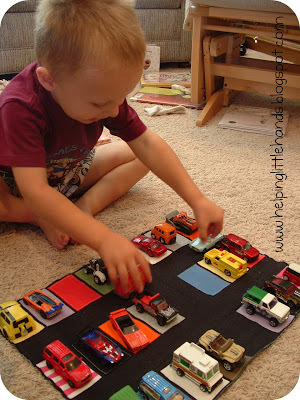 My son would have gone nuts over this when he was little as he loved to play car lot, but this even goes beyond just fun...it could be a tactile teaching tool to develop fine motor skills and sorting/color skills. Well done!